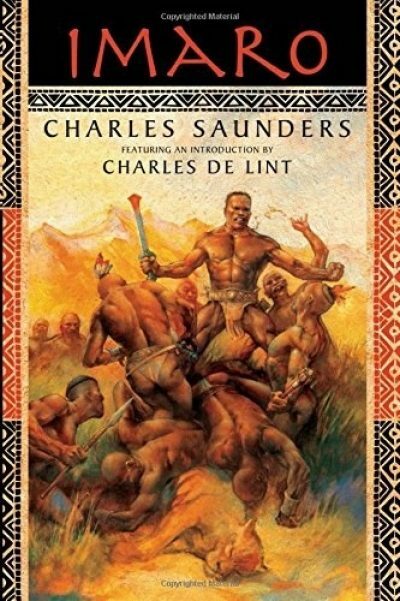 I admit I am cheating a smidge with this review of Charles R. Saunders’ 1981’s sword and sorcery fix-up novel Imaro. I’m reviewing the revised 2006 edition, the book I own, not the original (which differs in some ways). I’ve long since misplaced my copy of the second printing of the first edition. However … this is the author’s preferred edition. The laws of the Illyassai are unforgiving. Katisa may have recognized Chitendu, the man to whom she was promised in marriage, as a malign sorcerer, but at the time, no one else believed her. She refused to marry him, which was an offense against her people’s laws. Worse yet, she bore a child to an unnamed, non-Illyassai man, which was a crime worthy of death. However, her actions saved the Illyassai from the sorcerer, so she was granted a boon. She would be allowed to raise her son Imaro for the first five years of his life. After that, Imaro would be surrendered, to be raised with the other boys, and Katisa would be exiled for life. And so it was. The motherless boy does not have an easy life. Imaro’s very appearance is an endless reminder that his father was not Illyassai. Imaro displays matchless skill and strength, but he will always be Other … which, in the eyes of his mother’s people, is an unforgivable sin. Despite his stalwart adherence to the Illyassai laws, there will always be rivals plotting his downfall. Eventually he must accept that he will never win more than grudging tolerance. But the Illyassai land is a very small part of a very large world. When Imaro ventures outside his childhood home, he finds danger—and friendship. The cover of the book I have isn’t the cover the publisher had planned or even the one I eventually purchased back in 1981. That cover design was notable for the tag ine “The Epic Novel of a Black Tarzan.” The Edgar Rice Burroughs estate took strong exception to this claim; they guarded the Burroughs’ rights (as they saw them) with an energy worthy of the Mouse. I don’t think the original cover ever saw the light of day. The delay caused by last-minute replacement did the author no favours. The tagline was revised to read “The Epic Novel of a Jungle Hero.” Both taglines were a clumsy attempt to market African-influenced secondary world fantasy to predominantly American audiences. Someone at DAW hoped that readers who had liked Tarzan might be tempted to buy another novel about an African hero who is in no way like Tarzan1. When that ran into legal difficultly, DAW went another African stereotype: jungles (golf clap). Even though there are few jungles in the book. Saunders, the author, had a much less limited notion of Africa. Imaro wanders through a varied landscape. The worldbuilding draws on the actual cultures of Africa, as re-imagined by the author. Saunders’ research shows; the setting is much richer than, say, some African pastiche based on a tourist trip to Kenya. DAW may have thought the book Tarzanesque, but Saunders is writing more in the vein of Robert E. Howard, the author of Conan. Saunders’ hero is larger than life, but this does not ensure easy victories. Imaro faces great obstacles, with no guarantee that he will vanquish them. The world Saunders creates shares another, unfortunate, trait with those imagined by sword-and-sorcery authors like Howard and Leiber. The odds of a female character making it all the way through the book are rather poor. At least Saunders makes it clear that women do not lead an easy life in his world. His female characters are something more than eye candy, which cannot be said of Howard and Leiber. I have not read the other two books in the series. 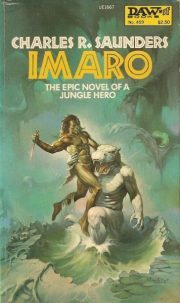 When I picked up Imaro, I wasn’t a sword and sorcery fan. Even though the book in hand was engaging, that was not enough to send me on a search for the others. Not that I ever saw copies of The Quest for Cush or The Trail of Bohu. Blame the terrible Canadian book distribution system of the day. Imaro may be purchased here. A rather interesting interview with the author may be found here. 1: They could have compared Imaro to the Phantom,but it is just as well they did not.